The responsibility for adhering to OSHA’s General Duty Clause (GDC) doesn’t just rest on an employer’s shoulders. It also involves every employee. In other words, OSHA’s General Duty clause in its entirety provides the foundation to an organization’s safety program. In layman’s terms, safety is everyone’s job. As the one responsible for your organization’s safety program, you invest an enormous amount of energy in getting the program set up right. The safety committee is an extension of you; they are your safety advocates within the organization. The General Duty clause helps ensure a safe work place for employees. An effective safety program built on this ensures employees will follow the rules that apply. It focuses on encouraging the right safety behavior, sending the message that everyone needs to work safe. » Determine if you need a safety committee or safety meetings. » Have a written policy outlining specific expectations and processes along with the consequences. » Determine frequency of your safety meetings and be sure to meet on company time. » Develop procedures for workplace safety and health inspections – where they need to be conducted, who conducts them and how often. » Train committee members in accident and incident investigation principles and how to apply them as well as in hazard identification. » Provide recommendations for correcting hazards identified. 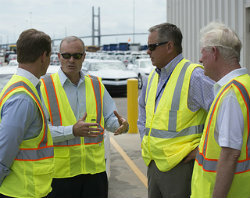 » Evaluate how employees are held accountable for working safely. » Ensure employees have a forum to express concerns about workplace safety and health conditions. No matter what type of business you’re in, OSHA’s rules and regulations affect your organization. As the safety coordinator you need to understand the general duty clause and general industry standards along with any specific standards that apply to the industry you’re in. GDC violations cannot be issued when a standard exists but can be cited if there is a hazard not covered by a specific standard that can cause serious harm to employees. Yes, it is citable!